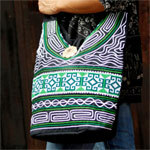 Working with cotton, the artisans of northern Thailand craft this shoulder bag by hand. The body feature waving and labyrinthine patterns stitched by hand and a large ribbon embroidered by Thailand's ethnic minority people. It fastens at the top with a hoop over a flower button carved from coconut shell. 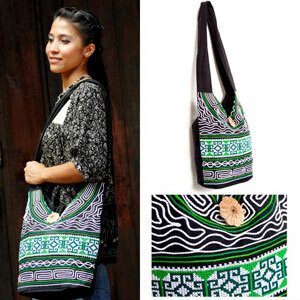 Fully lined, this versatile accessory features two practical pockets in the inside. Materials: 100% cotton, coconut shell. Lining 100% cotton.